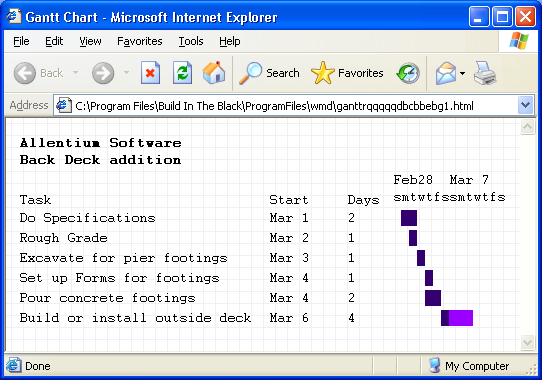 Build In The Black construction estimating software is a fast, flexible and complete tool. Build In The Black handles all of your needs for Estimating, Customer Specifications, Subcontractor Quotes and Bids, Accounting, Scheduling, and Sales Management. It automatically updates between these areas as you work. Let yourself get more organized as Build In The Black helps you plan, direct and control your projects. Built in Change Orders and Gantt Charts keep you on budget and minimize delays. Build In The Black does it all. Why buy several different programs, when all you need is one: Build In The Black. You can link your digital photos to the job screen and see a visual reminder whenever you click on that job. With one mouse click you can create a Gantt Chart with full color graphics that you can print and publish to the internet! Job export and Job import: an excellent new feature for those who need multi user capabilities. One of the new benefits is job sharing! This means that many workers with computers can work on different jobs at the same time, and then the jobs can be imported into the one main installation. This helps the accountant get all the updates very easily. This helps the project manager see the schedule across all of the jobs. In a typical construction company, the General Contractor creates a job on his laptop computer. Let's call this "Job 1" or "Job A". He fills out specifications, and enters what he knows about the job, at that time. Now he "gives" it to the Site Supervisor who will manage the job. a single file is copied to a USB stick. the job imports from the USB stick. Build In The Black construction estimating software improves your ability to plan, organize, direct, and control your construction project management in one easy to use software program. 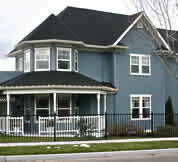 Build In The Black construction estimating software is designed to help you make more profit on your construction jobs. It is suitable for all types of construction, including new residential building, as well as for renovations and remodeling projects. The full retail price of Build In The Black is $995. This software package has been developed over 12 years and it is packed full of example contract agreements, request for bids, work orders, and more. We are here for the "long haul". 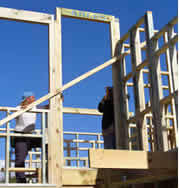 We listen to you, the builder, and carefully plan features into this unique construction estimating software program. From the foundation of this computerized tool, it has been engineered to be very flexible, and to grow in functionality over time. Most of the program is table driven. This allows Build In The Black to be flexible, and a very easy program to upgrade. Specifications - Land Development, Phase, Track, Lot, Structure, Floor and Room dimensions and details. Estimating - Quick Edit mode, Material Take Off, and Cost Estimate. Scheduling - Quick Edit mode, export and import with PDA’s, Management By Exception reporting, Production reports, and Gantt Chart. Accounting - Multiple Company support, GL, AR, AP, Job Costing, Employees, Timesheets, export Payroll information, Balance Sheet, Income Statement, the NAHB chart of accounts, and management of Taxes. Quotes and Bids - Purchase Orders, Work Orders, and Invoicing. 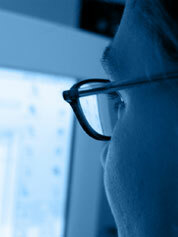 Manages quotes to suppliers, receiving bids and awarding bids; therefore, keeping you organized. Customer Management - Contact Logging, Features and Wish Lists, Contract Proposals, Draw Scheduling, and Recording of Sales Income. Master Lookup Tables - Maintains Vendor lists by organizing according to material, labor, equipment rentals and import price lists. 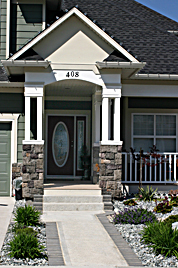 Maintains inventory; units and abbreviations; room types; and supplier categories. 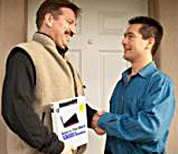 Maintains master lists of job materials, tasks, equipment, and labor. This expands as the database learns your business: enter new job items and tasks only once. This construction software includes security password sign in, which allows different users to access certain areas of the program you specify. 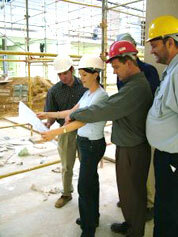 This construction estimating software also handles multiple companies, where each company has its own books and jobs. A built in Tutorial will walk you through each area of the program to show you exactly what is expected and the sequence to follow. A built in Wizard will step you through the main areas of the program in an interview mode. This residential scheduling system can handle your automatic job costing, while it tracks all of your revenue and expenses, consequently placing them in their proper ledgers. Build In The Black also handles POs, WOs, and Invoicing, and prints all of your accounting reports effectively. This residential cost estimating software automatically updates between specifications, estimating, quotes, bidding, scheduling, and accounting, making it simple to use. To run the Build In The Black construction software application for estimating, scheduling, quoting, customer management, accounting, and building specifications, see the purchase screen. *Linux is a registered trademark of Linus Torvalds. *Windows is a registered trademark of Microsoft Corporation.